Joanne Sorte has worked as an early childhood professional for over 40 years. She received a Bachelor of Arts degree in child development & family life, and a Master of Science degree in human development and family sciences from Oregon State University (OSU). She began her early childhood professional experiences as a home visitor for the Home Base program in Yakima, Washington, directed a preschool program for Lower Columbia College in Longview, Washington, and worked as a family services coordinator for Head Start. She then taught for 27 years as a Senior Instructor for the College of Public Health & Human Sciences at Oregon State University. During this time she also served as Director of the Child Development Laboratory developing a blended early education preschool program model in which children from low-income families participate through support of the Oregon Head Start Prekindergarten Program, along with children who have special developmental needs and children from the general community. She directed the practicum experience for students majoring in child development, supervised graduate students, and facilitated research on child development and wellness. She has coauthored an intervention program for preschool settings with Inge Daeschel, called Health in Action: 5 Steps to Good Health. Recently retired, she continues to enjoy assisting early childhood settings to partner with families to improve children’s health and wellness. Inge Daeschel is a licensed and registered dietitian who is board certified as a specialist in pediatric nutrition. She received her Bachelor of Science degree in foods and nutrition science at Plattsburgh State University in New York. She completed her dietetic internship at Massachusetts General Hospital in Boston and received her Master of Science degree in nutrition science from the University of Tennessee at Knoxville. She worked at Duke University Medical Center, first as pediatric dietitian clinician and later as assistant chief clinical dietitian. This position was instrumental in developing her interest in helping families understand the nutritional needs of their children. She and her family relocated to Oregon where she worked at the Corvallis Clinic. Later she accepted a faculty position as instructor in the College of Public Health & Human Sciences at Oregon State University (OSU) where she was health and nutrition services coordinator of the OSU Child Development Laboratory and the OSU Oregon Head Start Prekindergarten Program. Recently semi-retired, Inge is currently a nutrition consultant providing services to a WIC program, an Early Head Start and two Head Starts programs including the OSU Child Development Laboratory. Her expertise in feeding children is based on personal as well as professional experience, gained raising four children, including one with multiple food allergies. 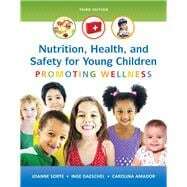 She has coauthored with Joanne Sorte an intervention program called Health in Action: 5 Steps to Good Health, which promotes wellness by providing focused messages that address nutrition and physical activity in early childhood programs. Carolina Amador, M.D., MPH is a board-certified general pediatrician. She received a bachelor of education degree in speech pathology at the University of Georgia. She earned her medical degree from the Medical College of Georgia in Augusta and completed her residency in pediatrics at West Virginia University in Morgantown. She worked as chief resident in pediatrics at West Virginia University where she developed a lactation clinic as well as a focus on advocacy for breast-feeding mothers. She has a master’s degree in public health from the University of Washington in Seattle with a focus on maternal and child health. She moved with her husband to Corvallis, Oregon, and has worked as a general pediatrician for 12 years and is currently employed by a community health center that serves a large percentage of Hispanics and migrant workers. During these years as a general pediatrician, she has developed professional interests in childhood obesity prevention, health disparities, and Latino health. She has been involved in community events and organizations advocating for children’s health including the Oregon State University Oregon Head Start Prekindergarten Program Health Services Advisory Committee, the Benton County Healthy Weight and Lifestyle Coalition, the Benton County Oral Health Coalition, and the Breastfeeding Coalition of Benton County. Throughout her years of education and medical practice, she has participated in several international health experiences in Ecuador, Honduras, Uganda, and Malawi.